Strip-piecing is a wonderful quiltmaking technique: you sew long strips of fabrics together and then cut shapes from this newly assembled fabric. Many of my patterns use this technique because I think it’s a great way to add interest to a quilt: it allows me to add sections of shaded colors to quilt. My Summer Lily quilt uses this technique extensively. Strip-piecing makes it very fast to create these high-interest quilt patches, but you do make sacrifices in fabric use: any of the strip-pieced fabric not covered by a template is not used in the quilt. 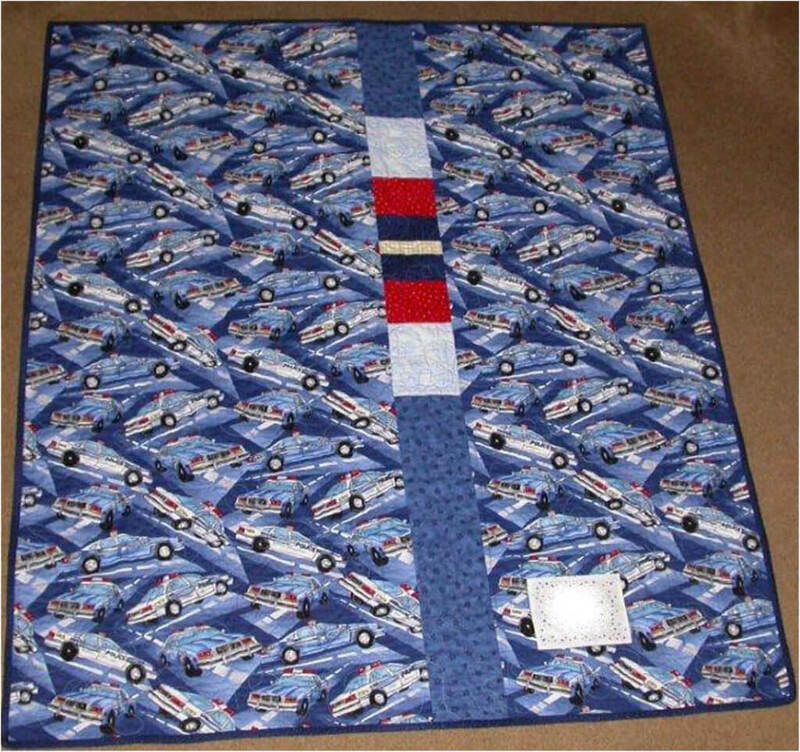 The portions of the strip-pieced fabric not covered by a template are not used in making the quilt. Mark the fabrics to be used for each strip on the template pattern. Place the template plastic over the pattern and copy the sewing lines and outside cutting lines. You’ll also need to trace the horizontal lines that indicate the edges of the strip. Those lines are the finished strips, so you must also trace lines 1/4″ outside. (Jinny’s Perfect Piecer is ideal for this task.) Also be sure to add the piecing number to the template. These lines are marked straight from the template pattern. The dashed lines show the sewing lines/finished size of the patch. Add the outside cutting lines to the top and bottom of the patch. Mark the Templates. 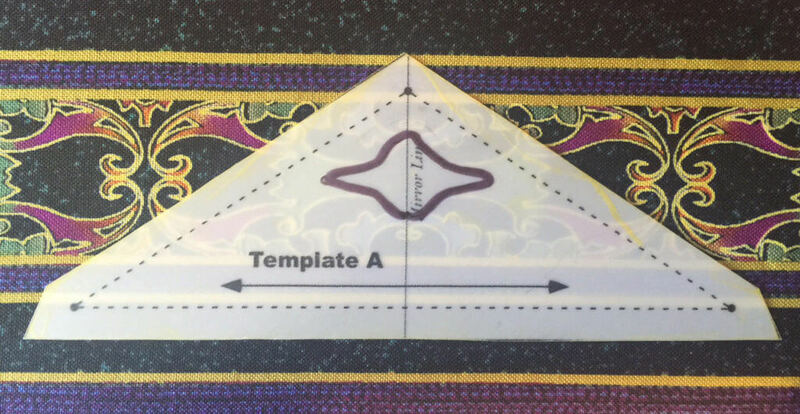 Be sure to make each template with the template letter or number, the fabric to be used and the grainline arrow. (The grainline would typically follow the length of the strip.) 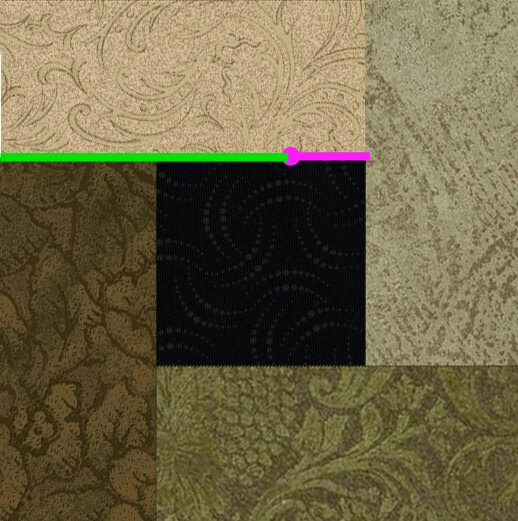 Mark the seam intersections on your templates then transfer them to the wrong side of your fabric patches. This will make it much easier to match together the individual fabric patches when sewing. What do you do if only the outer template edges are marked in the pattern? Jinny Beyer Studio patterns always indicate the fabric strips on the templates, but other patterns may not. It’s still possible to create the templates you need. Read the pattern to determine the cut width of the fabric strips for the particular template with which you’re working. Substract 1/2″ from that cut width to determine the finished size of the fabric strip. For example, if you are instructed to cut strips 3″ wide, your finished size will be 2 1/2″. If your template pattern has only the outside edges marked, draw lines 1/4″ inside those lines on all sides to mark the finished size. Next, measure the finished strip width (2 1/2″ in our example) up from the line marking the bottom finished edge and mark a line parallel to the bottom edge. Continue in this fashion to finish marking the template. 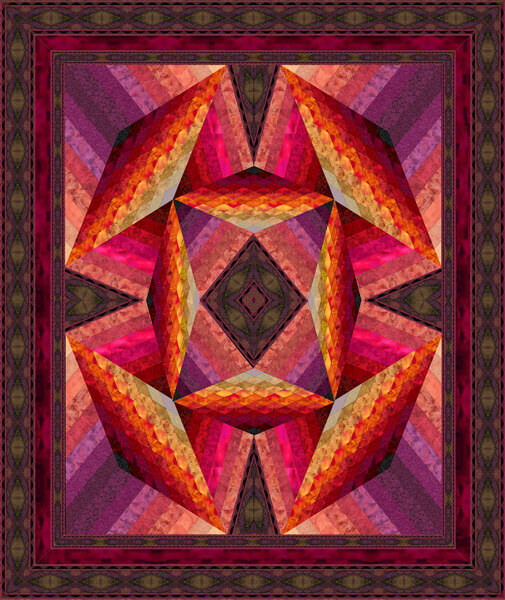 Foundation-piecing — often called “paper piecing” — was one of the great revolutions in quiltmaking. The technique makes it easy to get very accurate seams and wonderfully sharp points. However, it can’t be used for all blocks, and projects using foundation piecing are not portable. Fortunately, it’s not difficult to convert a foundation paper to be sewn using traditional techniques. Let’s see how with the Day Lily block from the Jinny’s Garden block-of-the-month quilt. Make Templates. To make a template, lay a sheet of semi-transparent template plastic over the foundation. Using a permanent marker, trace the first shape onto the plastic. Those lines are the sewing lines, so you must also trace lines 1/4″ outside. (Jinny’s Perfect Piecer is ideal for this task.) Also be sure to add the piecing number to the template. This is the original block foundation. Trace the shape from the reversed foundation onto template plastic. Mark lines 1/4-inch outside the original lines. Be sure to number the template and add a grainline arrow. For Fewer Templates. To reduce the number of unique templates and patches you need to make, look for symmetrical patches. Many blocks — foundation and traditional — have patches that are repeated in the block as reverse or mirror-image patches. To cut out a mirror-image patch, you simply flip the template upside down. You find mirror-image patches on the opposite side of the center line in a block. We’ve marked the center line on the Day Lily block. The patches marked 12 and 13 are mirror-image. Patches 8 and 9 look like they are mirror-images, but after making the template for 8, we discovered that 9 is a little different. It would need its own template. You can also alter the patches a little to gain a little more symmetry. Foundation piecing requires that your next patch always covers the raw edges of the previous patches. So in Day Lily, Patch 11 is designed to cover Patches 8, 9 and 10. In traditional quilt making, that’s not necessary, so you could re-draw Patch 10 to extend to the center line. Patch 11 is then the mirror-image of Patch 10 — one less template to make! 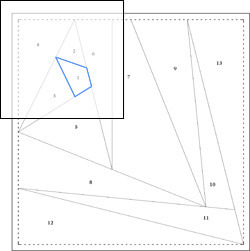 Patch 10 is re-drawn to end at the diagonal center line of the block. Patch 11 is now the exact mirror-image of Patch 10 and can use the same template. Mark Seam Intersections. Foundation blocks often have patches with very sharp or unusual angles. 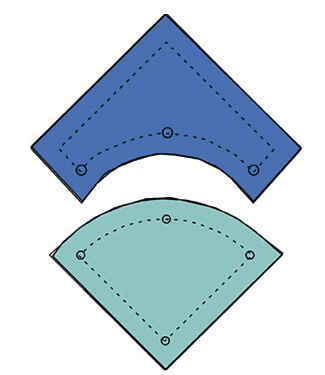 It can be difficult to determine how to fit these patches together, so mark the seam intersections on your templates then transfer them to the wrong side of your fabric patches. Although the importance of accurate seam allowances is drilled into every quilter, most of us end up with blocks that are not quite the right size at times. Knitters are masters at blocking their pieces into shape, and quilters can add this skill to their arsenal, too. 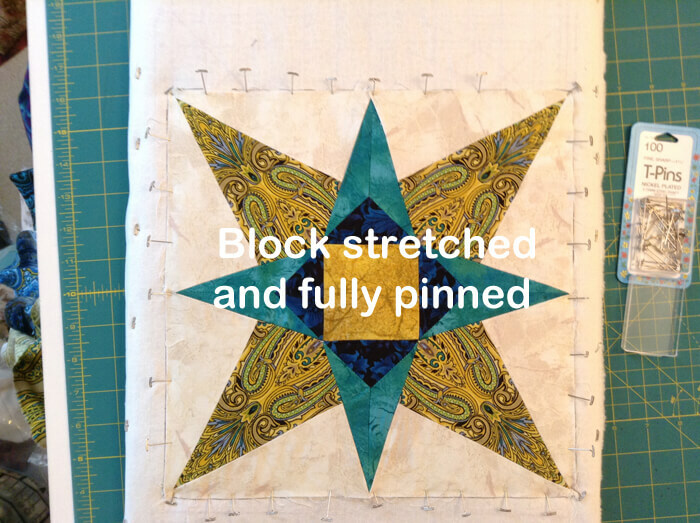 We’ll show you how to do this using sample blocks from Jinny’s Starstruck BOM quilt. Most of us have a portable pressing surface with gridlines. We like to cover ours with muslin or another light-colored cotton fabric for two reasons: the gridlines probably don’t match our desired block size, and (if you are like the Studio staff) the pressing surface is likely to be a little grungy! Stretch the fabric over the pressing surface and pin it in place. Mark the desired block size on the cloth. Here we’ve used a heat-erasable pen which makes it easy to re-use the cloth for different-sized blocks. If you will be blocking a large number of same-size blocks, you might want to choose a marker that won’t disappear with heat. In this instance, the block needs to be 12-1/16″. Start by using T-pins to pin each corner of the block and the center of each side, stretching the corners and edges to meet your marked block outline. Continue pinning. Once everything is pinned, press the block from the center out to the edges, using steam, steam, steam! Let it cool completely before removing the pins. Once everything is pinned, press the block from the center out to the edges, using steam, steam, steam! Let it cool completely before removing the pins. You might also try spraying your block with a sizing agent after pinning but before steaming. That can help your block hold its shape. There is a limit to how much you can stretch a block, but this technique can give you blocks that are much closer to the desired size — which will make assembling your quilt much easier. Blocking with steam can also be used to shrink up a block a little bit. 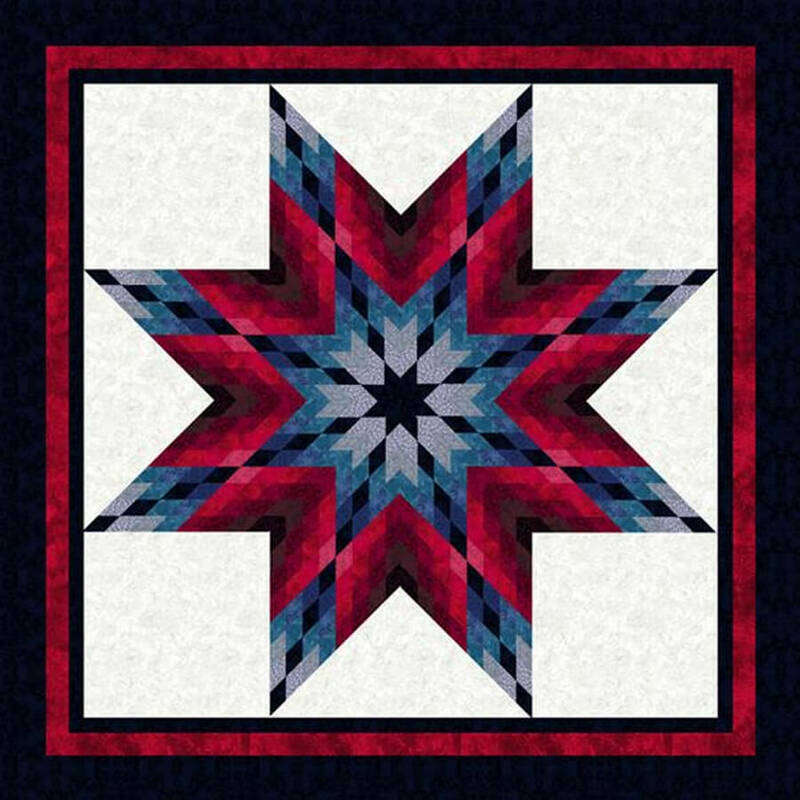 As always, we recommend you test this process on an extra block before trying it on one destined to be used in your next quilting masterpiece! Most quilters are frugal when it comes to backing their quilts. Of course, it’s important to use the same quality fabric as you used on the front. But it’s frustrating when your quilt is just a little wider than your backing fabric. That’s where creativity comes in. You can always make your backing wider by adding a panel of contrasting or co-ordinating fabric or orphaned blocks. This quilter added a panel of pieced fabrics left over from the front of the quilt. Orphan blocks were the salvation here . . . and now the quilt is virtually two-sided. The quilter used nine left over blocks, then framed them in a coordinating fabric. Another solution is to piece your backing with a diagonal seam. Several years ago, quilter John Flynn introduced us to a method using a diagonal seam across the back to save on fabric. It works on quilts that need backing up to about 60″ wide. This Diagonal Backing Worksheet illustrates how to make a diagonal backing and tells you how much fabric you need for you quilt. It works two ways. First, it is a PDF form so you can download it and then fill in the first three boxes on your computer. Adobe Reader will automatically do the calculations and figure out how much fabric you need for backing. Second, you can download and print the form. Just follow the instructions to determine the fabric requirements.